Q&A: What happens if U.S. breaks borrowing limit? 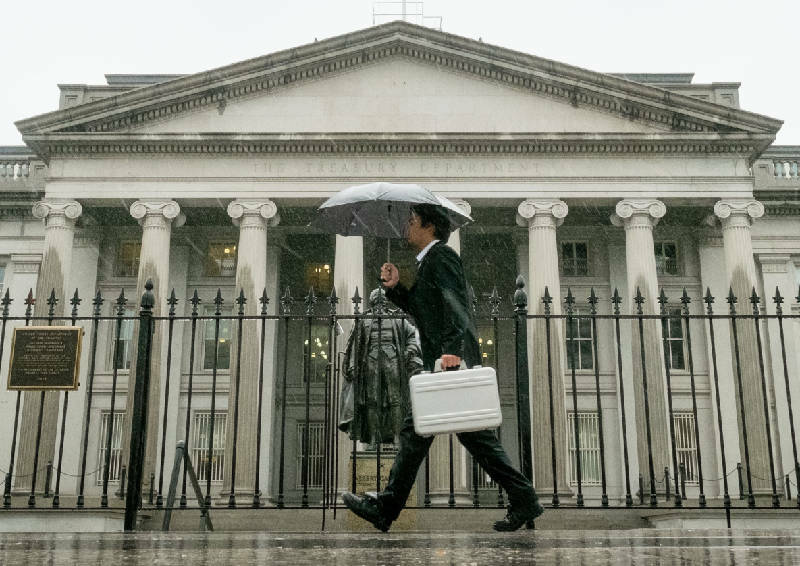 A pedestrian walks past the U.S. Treasury Building in Washingtony. The national debt actually reached the limit in May 2013. Since then, Treasury Secretary Jacob Lew has made accounting moves to continue financing the government without further borrowing. But Lew says those measures will be exhausted by Thursday. The government will then have to pay its bills from its cash on hand - an estimated $30 billion - and tax revenue. WASHINGTON - Negotiations in Congress to raise the nation's borrowing limit are up against a deadline of Thursday. If the limit isn't raised by then, the government will no longer have authority to borrow to pay its bills. So what happens if Thursday comes and goes and the limit isn't raised? The scary thing is, no one really knows. Going past the deadline would be unprecedented. The possible consequences are complex. But none are good. The gravest threat is that the government would soon fail to make interest payments on its debt. Any missed payment would trigger a default. Financial markets would sink. Social Security checks would be delayed. Eventually, the economy would almost surely slip into another financial crisis and recession. Even if the government managed to make its interest payments, fears about a default could cause investors to dump Treasurys and send U.S. borrowing rates soaring. A. The borrowing limit is a cap on how much debt the government can accumulate to pay its bills. The government borrows in most years because its spending has long exceeded its revenue. The first borrowing limit was enacted in 1917. Since 1962, Congress has raised the borrowing limit 77 times. It now stands at $16.7 trillion. A. The national debt actually reached the limit in May. Since then, Treasury Secretary Jacob Lew has made accounting moves to continue financing the government without further borrowing. But Lew says those measures will be exhausted by Thursday. The government will then have to pay its bills from its cash on hand -- an estimated $30 billion -- and tax revenue. And without cash in reserve, any minor glitch could cause Treasury to miss a debt payment -- and default. A failure to pay any obligation "would severely damage perceptions of our creditworthiness," says David Kelly, chief global strategist at JPMorgan Funds. Each week, the government issues new short-term debt and uses the proceeds to pay off maturing debt. This step doesn't increase total debt. So it would still be allowed even if the borrowing limit wasn't raised. But it's possible that not enough investors would want to buy the new debt. That would leave the government short of cash to pay off its maturing debt. The result: a default. Q. What else could Treasury do? A. It could make its interest payments first -- then delay all other payments until it collects enough tax revenue to make a full day's payments. That would avoid choosing among competing obligations. Treasury officials favored this approach during the last borrowing-limit fight in 2011, according the Treasury Department's inspector general. But that approach would eventually cause extensive delays. On Nov. 1, nearly $60 billion in Social Security benefits, Medicare payments and military paychecks are due. With no increase in the borrowing limit, those payments could be delayed for up to two weeks. Q. Could the president just ignore the limit? A. Some experts say he could. The 14th Amendment to the Constitution says, "The validity of the public debt of the United States, authorized by law ... shall not be questioned." But the White House has said its own lawyers don't think he has the authority to do so. Nor is it clear that many investors would buy bonds issued without congressional approval. Q. Are global investors panicking yet? A. No, not yet. The stock market surged on Thursday and Friday as Congress appeared to move closer to an agreement to raise the debt ceiling and perhaps end the partial shutdown of the government. But if prospects for an agreement were to dim early next week, stocks could sink. Investors would likely also dump Treasurys. Interest rates on some short-term Treasurys have risen sharply in the past week. That shows that the deadline might be rattling some investors. The Bipartisan Policy Center estimates that the 2011 fight over the debt limit inflated federal borrowing costs by $1.3 billion, or about 0.5 percent, that year. Over 10 years, the estimated cost comes to nearly $19 billion. Q. What would the economic impact of all this be? A. Many foresee a nightmare. No longer able to borrow, the government could spend only from its tax revenue. This would force an immediate spending cut of 32 percent, the Bipartisan Policy Center estimates. If the limit remained through November, Goldman Sachs estimates that spending would plummet by up to $175 billion. That's equivalent to about 1 percent of the economy. On top of that, stock markets would likely fall. Household wealth would shrink. Consumer confidence could plunge. Americans would cut back on spending. Higher rates on government debt would raise other borrowing costs, including mortgage rates. Q. Why is it potentially catastrophic for the government to miss a payment on its debt and default? A. The repercussions would be felt worldwide. Banks in the United States and overseas use Treasurys as collateral when they borrow from each other. If Treasurys were no longer seen as risk-free, it would disrupt borrowing and jolt credit markets. A financial crisis like the one in 2008 could follow. Banks also hold much of their capital reserves in Treasurys. If they fell in value after a default, banks would have to cut back on lending.